I realize the strong shoulders of the 1940s decade is an intimidating turnoff for many, but I embrace them in all their forms. 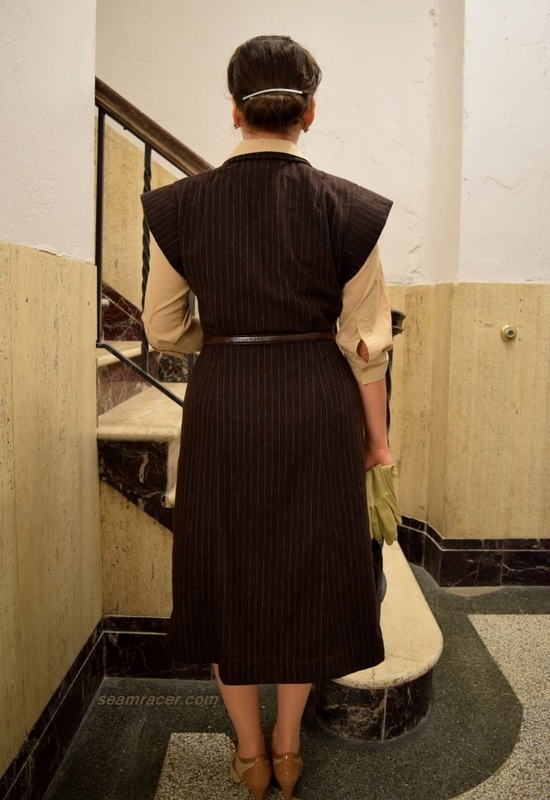 For whether they are obnoxious or poufy as they can be or just plain sharply tailored, I see the 40’s strong shoulder line as not only a crucial part of the fashion in, before, and after the WWII decade, but also a very interesting garment point often neglected. Such can be as fun to perfect as they are even more entertaining to see and construct in all its differing varieties. A strong, exaggerated shoulder line can do wonders for certain body shapes, as I think it does for mine. Although I am border line petite (just over 5 feet tall), I do not feel that my waist and hips are small enough in proportion to the rest of me, so the appearance of wider shoulders creates an illusion of the ideal body lines (tiny hips and waist). This is nothing new…I am just copying off of what worked for the famous actress Joan Crawford, when the equally famous Adrian used this same “trick” as what had been done in the 1830s and 1890s to distract the public eye away from conceived body faults about the midsection and create a certain image. As famous as well-known as both those names are, they had figured out something spot on that we who are in no manner Hollywood sweethearts can still imitate to our advantage. From a fascination of Crawford’s high, dramatic hairstyles to my amazement for Adrian’s penchant of precise pin striped garments, from the basic need for warm winter wear to the desire for an unusual item to try and sew, I have combined it all to end up with something that is an unexpected way to power through the cold! This jumper dress was made for a recent trip to visit the historic garment district in Kansas City, Missouri for the exhibit “Suited Up: Tailored Menswear, 1900 to 2017”. This section of town is claimed to have been (at one time), second only to New York in breadth of territory! This cozy outfit let me be a wintertime tourist in handmade, menswear-inspired style! 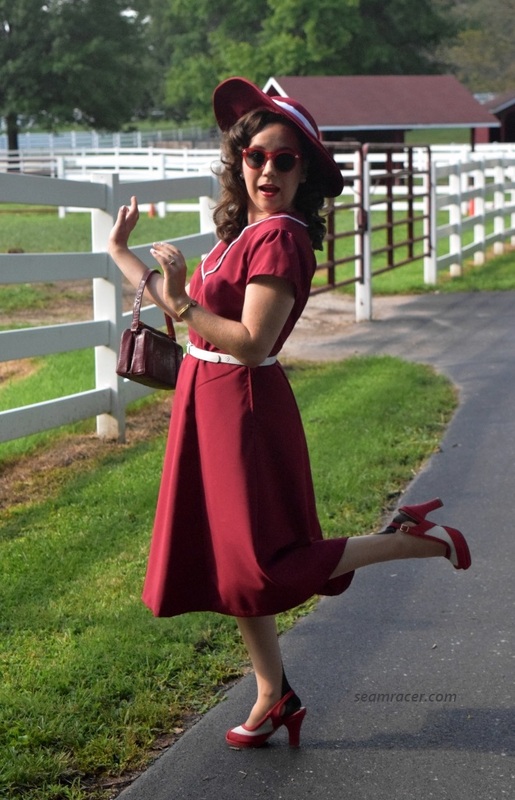 My shoes were very comfy for all day walking – they are Chelsea Crew brand “Gala” heels, reproduction vintage spectators. My blouse underneath is a resale store item, but my jewelry is true vintage from my Grandmother. I realize that all put together like I am, this is a more obviously vintage outfit than most other dated fashions that I make and wear, but I’d like to think that it is a statement enough to be attractive in its own way. I believe the general public that only relies on RTW is so ready for fashion to be something more appealing to them personally other than what is out there. 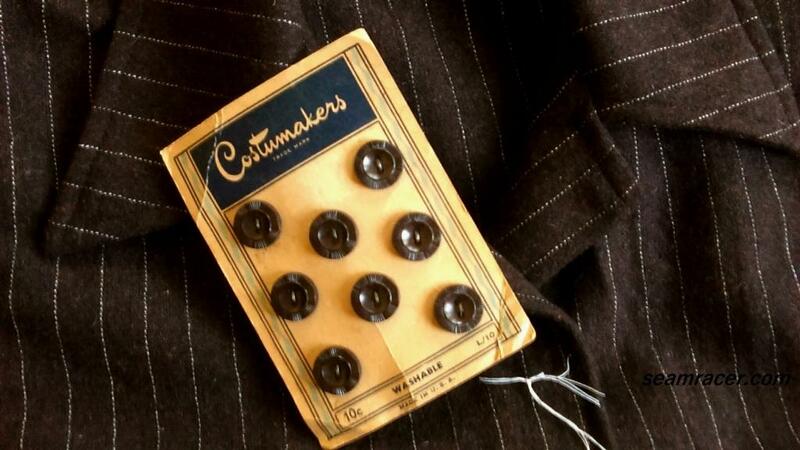 NOTIONS: The main notion used – the numerous buttons down the front – are a prized vintage card authentic to the 1940’s which had been found at our favorite local antique store. 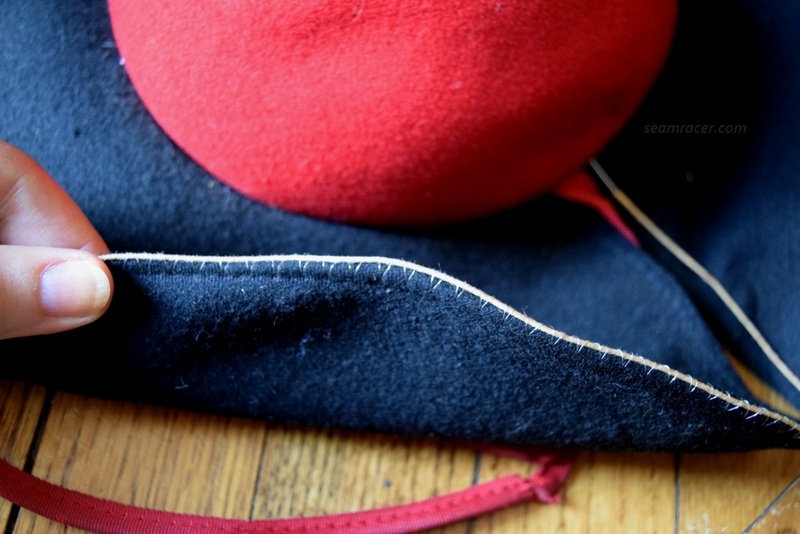 The rest of what I needed – the thread, interfacing, bias and hem tapes, as well as shoulder pads – are modern notions and were already in my stash of supplies. TIME TO COMPLETE: This was made in about 25 to 30 hours…I took my time to get details done just the way I wanted them! It was finished on February 9, 2018. THE INSIDES: As this was pure wool, it was therefore rather a rather itchy fabric which would fray a lot at every raw edge. Thus every seam was finished off with bias tape, with the hem covered in a lace tape for a fun and feminine finish! TOTAL COST: This wool was a gem of a fabric I found in my local Jo Ann’s Fabric store. I don’t remember what the cost was purely because this kind of fabric is so lovely and hard to come by in brick-and-mortar stores here, so I had to have it regardless of cost. Nevertheless, I had a discount coupon and 40’s patterns do not need a whole lot of fabric, so – for just over 2 yards I think I spent under $30. Ah – Adrian and Crawford…one would not be as famous without the other, but I suggest Adrian owed more to Crawford than the other way around. Crawford had been in movies since the 1920’s, but her broad shoulders served her well in the boyish and hip hugging fashions of the era – she was the right body for the mode of dressing then. When the 1930’s came along and Crawford was starring in movies where she played as a softer, sexier and wildly talented woman, she needed a signature style to match in Hollywood. In 1932, Crawford wore a dress designed by Gilbert Adrian know as the famous “Letty Lynton Dress”, a white organdie dress with big puffed sleeves which were covered in ruffles, to make her look feminine and demure. It is often credited with being the first movie fashion to be widely copied and sold for the public. Crawford’s wide shouldered dress gave the impression of a tiny waist and slim hips, and the illusion created by Adrian was suddenly in steady demand with popular fashion whether that garment was in a store, from a sewing pattern, created by a tailor, or from other designers. This would last strongly through the 1940’s, recurring again in the 1980s, when heavily padded and extreme shoulders were common. Crawford’s movie roles in the 40’s became harder, stronger, and frequently troubled, and so her large shoulder signature style stayed with her but changed to match until after Dior’s “New Look” styles became the craze. In Adrian’s own story from the book, Creating the Illusion, he said that Crawford insisted on full freedom of movement with her arms, so much so that he had to leave excess fabric which was then padded to not appear sloppy. 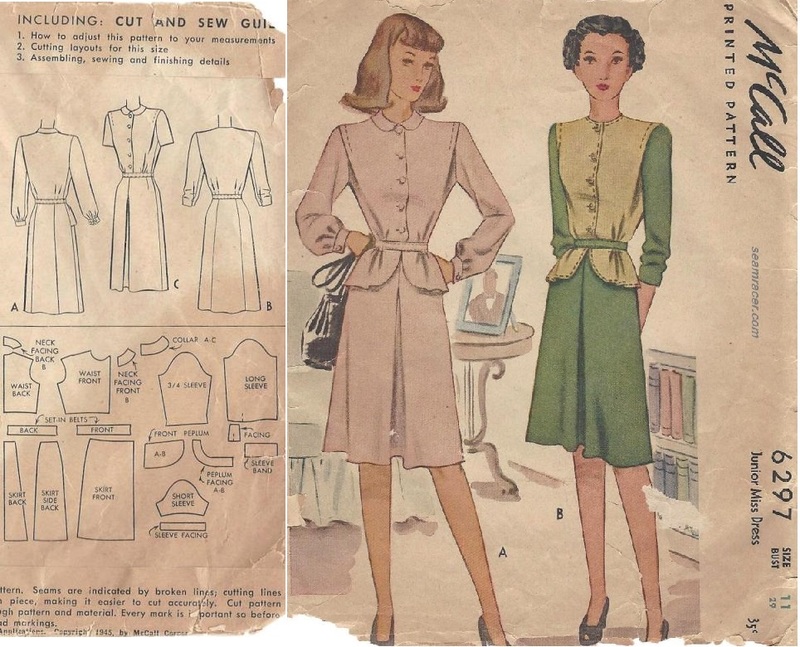 I do notice that many 1940’s era vintage patterns leave extra room in the shoulders, and I regard that as room you need for shoulder pads! But whether the use of padding came from Crawford’s fit preferences or Adrian’s direct styling for her body, between the two of them it is a silhouette and a technique that was influential and unmistakable. Crawford was Adrian’s perfect outlet to manifest the genius of his talent. It took the perfect actress in the perfect outfit to make the world notice her clothes to a point that the world how the copy that fashion for themselves. Unlike today, the designers were something to think about afterwards, as the Academy Awards for Best Costume Design wasn’t started until 1948. Adrian designed the costumes for Joan Crawford in more than twenty-eight movies. Granted, he did wonders designing spectacular, mind blowing outfits for other actresses, but it is how Joan Crawford wore what he made that had a outreaching effect that is still being discussed and understood today. Now, the original design for this jumper-dress on the envelope cover is much more understated than how mine turned out and I wanted it this way! Since I was wearing this to see an exhibit on menswear, I wanted something strong and broad as the famous London-cut padded suit for guys of the early 40’s with a hint of the outspoken Zoot Suits. 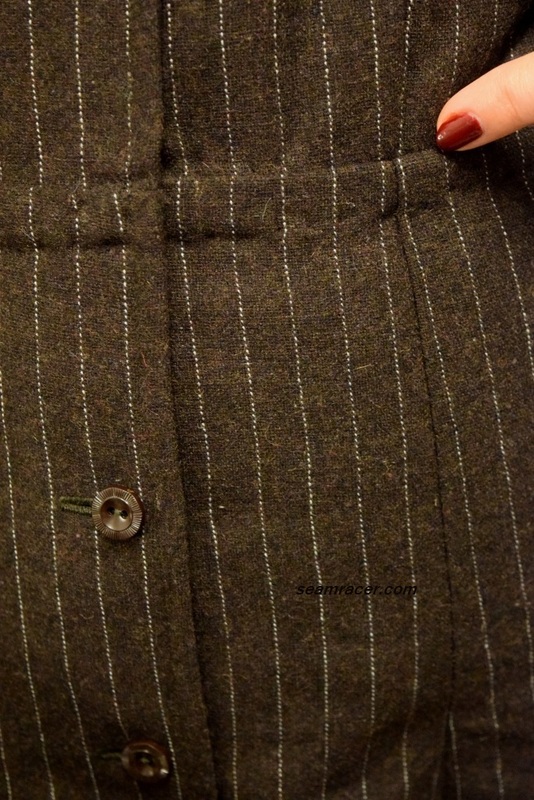 Adrian himself was a perfectionist at suits and loved to show the height of his ability by having stripes show off the seam lines (see this 1948 suit at the New York MET museum for only one example). Following these trains of thought, I also was tempted to add a welt pocket on the chest like a true suit, but as you can see I thought otherwise in the end. I do love how my jumper dress ends up having a double collar, as I wear the shirt underneath on top of the jumper lapels to cover the wool and keep it from itching my neck. This is better than a man’s vintage suit which doesn’t have this double collar benefit! Sewing it was much easier than making a complete suit but has all the same feel as one in a dress version. I have seen such a unique kind of clothing as a jumper-dress before in a few other 1940s and 1970s patterns and I really like the whole idea of it – a one-piece garment that can be worn with a blouse underneath like a jumper or still work being worn alone as a dress. 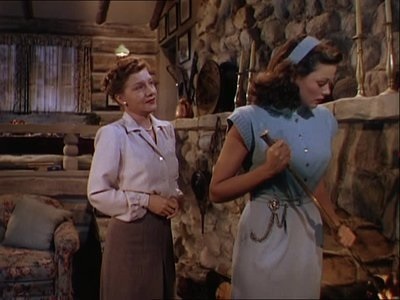 The famous actress Gene Tierney wears a very similarly styled jumper-dress, in a lovely light blue sans blouse underneath, in the 1945 movie “Leave Her to Heaven”. The banded armscye (as this kind of shoulder extension that looks like a sleeve is called) was stiff and sticking out on its own on Gene Tierney, and I used heavy interfacing to copy that appearance. However I have found an extant jumper-dress in rayon crepe that has a limp, unstructured banded armscye and it is amazing how one small detail as the weight of interfacing can change the whole “look”. I have even seen a banded armscye which is highly decorated on this fancy 1940’s blouse, or one used upside down in this 1930’s evening gown. 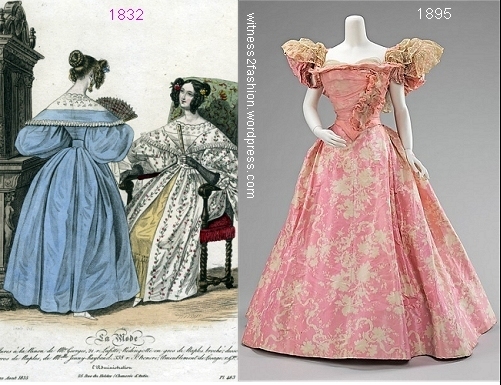 The more you look at fashion from the past, the more you see the variety our modern RTW fashions are missing. The pattern for a banded armscye has the general shape of an almond because it is folded in half to be a double layer self-facing piece. However, this “mock sleeve’’ needs to have a much lower dip, meaning the side seam is closed at a much lower point than regular garments with a true set-in sleeve. 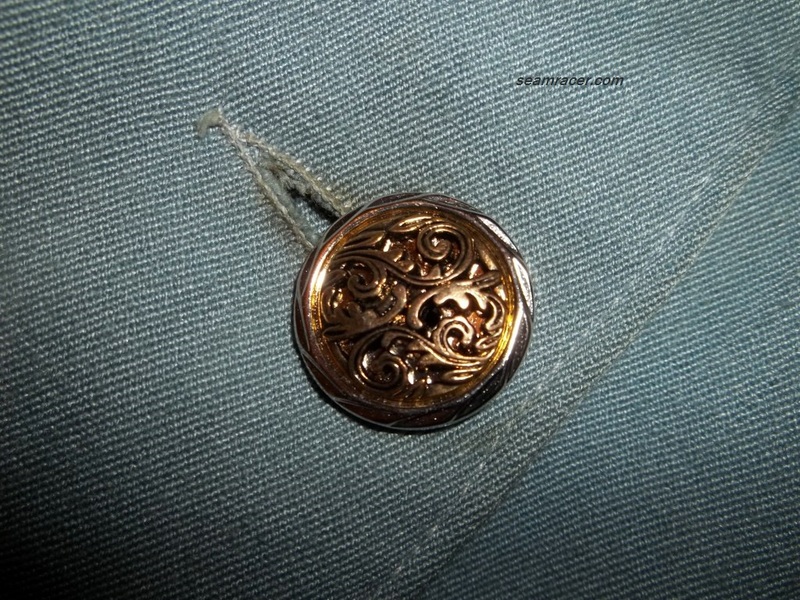 There is a triangular insert piece that can be added to the bottom point of the armscye where it ends at the side seam, meant for when this is worn alone as a dress. Of course, for this to be that versatile it would not be made from a wool but out of a gabardine, linen, or rayon of some sort, or something else multi-season with some body because I don’t like the ‘limp’ look of that extant dress I mentioned above. You have to just go all the way for some styles like this – to carry off powerful fashion is obviously being committed to a style that is every bit as strong as you are…or want to be! Crawford often said that she never went out anywhere unless she looked like “Joan Crawford the movie star”, so I’m supposing that this powerful fashion of hers was like being vested in more than clothing. Clothing has been described as armor that makes us feel whole or keeps us safe from what brings us down. The design was deceptively simple, really. It wasn’t much harder than a shirt with a skirt attached, but it was the tailoring and details that I spend most of my time on to make this. The layout required a large amount of brain power to have the stripes match as impeccably as an Adrian inspired garment could become. 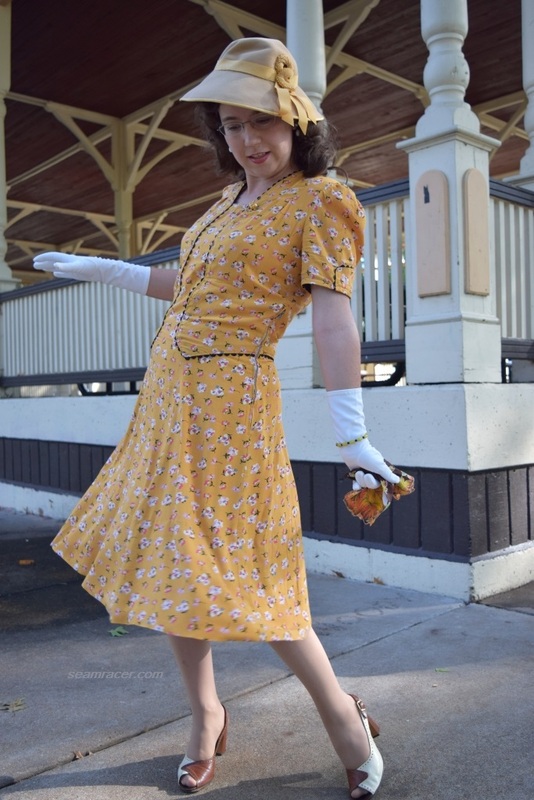 I must say I was impressed at how well this pattern fit on me and came together, as some 1940s Simplicity patterns can be not that great, so the design deserves credit for my success – and I am quite pleased with this! I love how the pin striping miters in at the seams, and even ended up matching so well where the darts meet the skirt at the waist. I even somehow got the collar to match! To highlight the design and lay around with the striping, I had the banded armscye be horizontal while the rest of the dress was generally vertical. Adrian was a fan of a geometric approach to clothing. Making all those buttonholes down the front and matching the buttons in place is and will always be such an exhausting thing to do for me, but every time I see such a garment finished it becomes so worth it in the end. This garment is especially the case because I used an intact card of vintage buttons, which I was so excited yet reluctant to use. It’s not that I want to just stash such treasures, or just hold onto them because they do not serve their intended purpose or get to shine just sitting in my collection! It’s just somehow harder to incorporate an old notion into my modern vintage when I feel that I have to separate it from its lovely, dramatic, pristine display placement on a perfect condition button card. Such notions like this remind me of how upscale and respected home sewing used to be, besides the fact that the quality of our modern notions have dramatically gone downhill! The buttons match so well with the wool in color, but it seems to me that their complex face makes them a subtle but still noticeable detail. 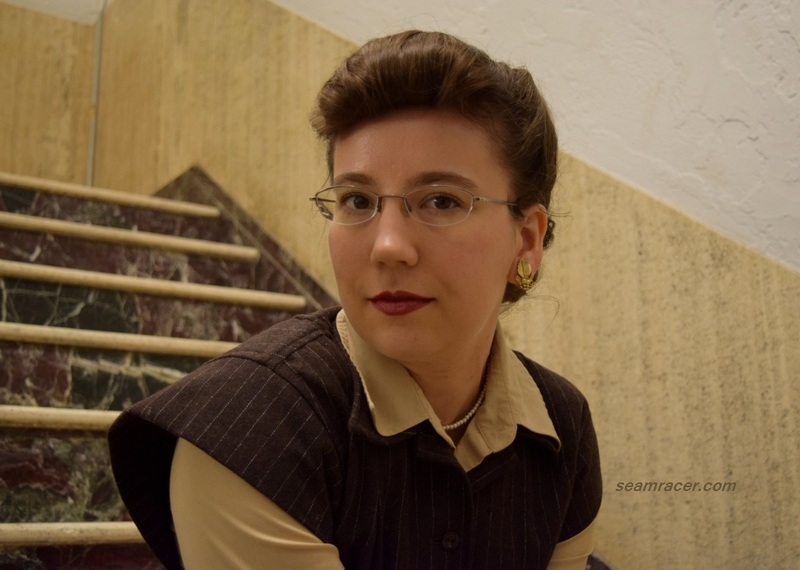 I am quite proud of the statement 40’s hairstyle I pulled off with this outfit! Joan Crawford seemed to wear her hair high up above her forehead on top her head frequently circa 1944 (see here and here), as did her fellow actresses Rosalind Russell and Paulette Goddard to name a few. Their hair is similar but seems to be more of a comb over than an under roll like mine, making it closer to a Dorothy Gray style. Realistically, I am not an actress and I needed a hairstyle to stay in place all day! With a lot of hairspray and pins, it did stay! 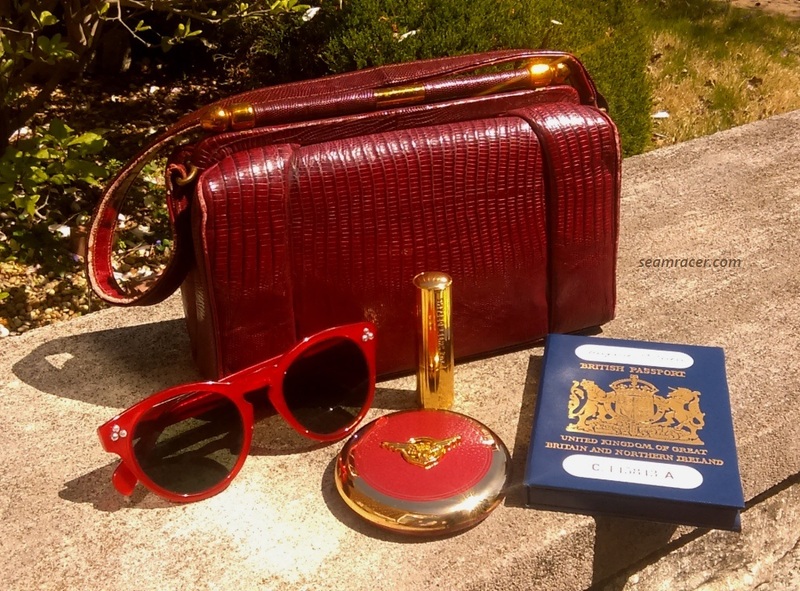 Beseme brand “Red Velvet” lipstick completes the vintage look. So many times, more than I can tell you, I hear from people who meet me, “…and, you’re a school teacher?” As if it’s a half statement, that’s still a half question. I really don’t know why this is – I do like tutoring but maybe it’s the eye glasses, he he! 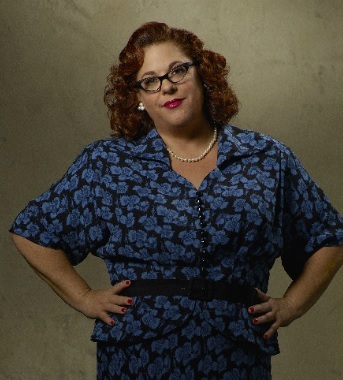 Nevertheless, I’m embracing the school teacher vibes this time – the vintage 1940’s way! My teacher’s outfit is authentically completed by a vintage oversized key brooch on my lapel, true 40’s alligator leather heels, and a post-WWII school building as our photo shoot backdrop. 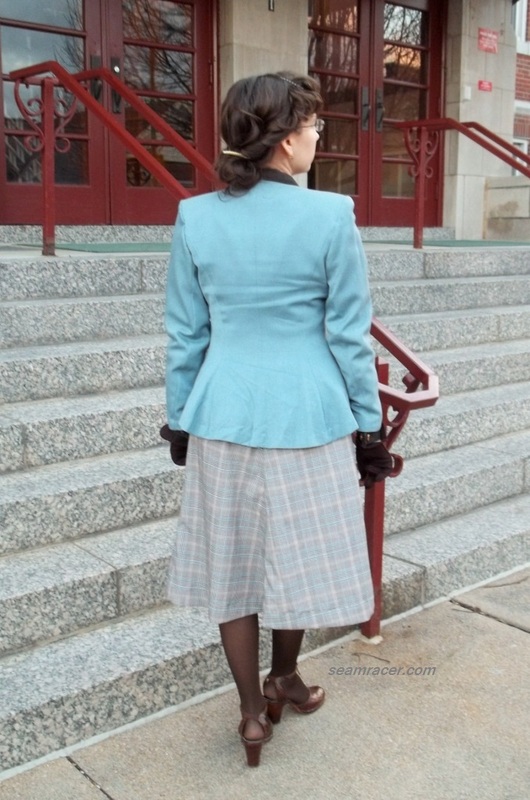 This 40’s suit is achieved from an eclectic mix of vintage and vintage repro, sewing and refashioning. The jacket is a true vintage piece that had seen better days (sadly), so I refashioned it using the skirt to salvage something wearable. 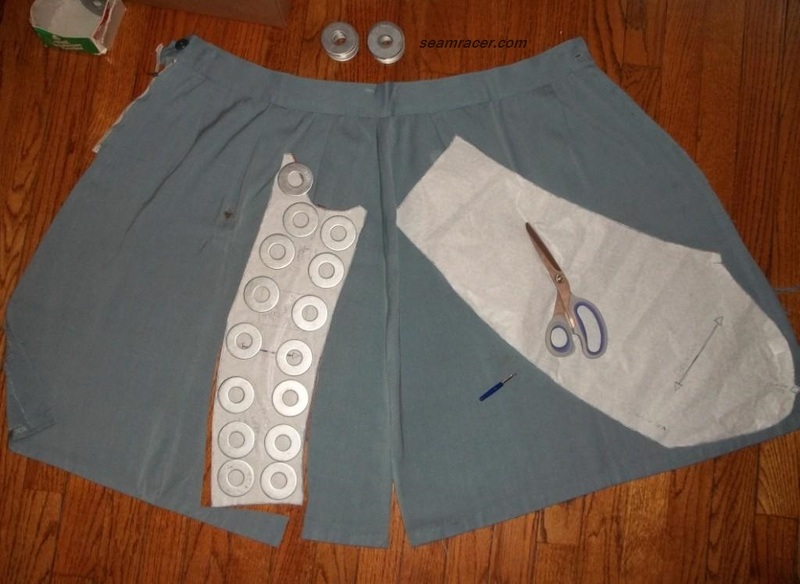 The skirt is made from a modern re-issued Simplicity pattern and some polyester plaid. The blouse is made from a true vintage pattern and classic cotton for a basic, versatile wardrobe staple. All these pieces have differing years in the 1940s as their sources. 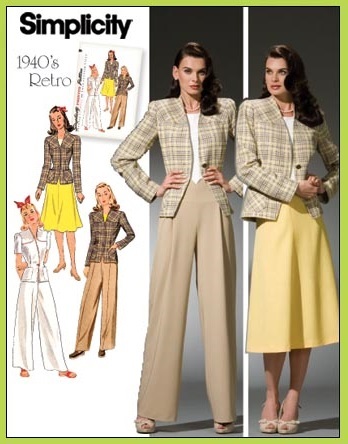 Together, I end up with a cohesive 1940’s suit that is warm and classy to wear in the winter, and something I love to wear! 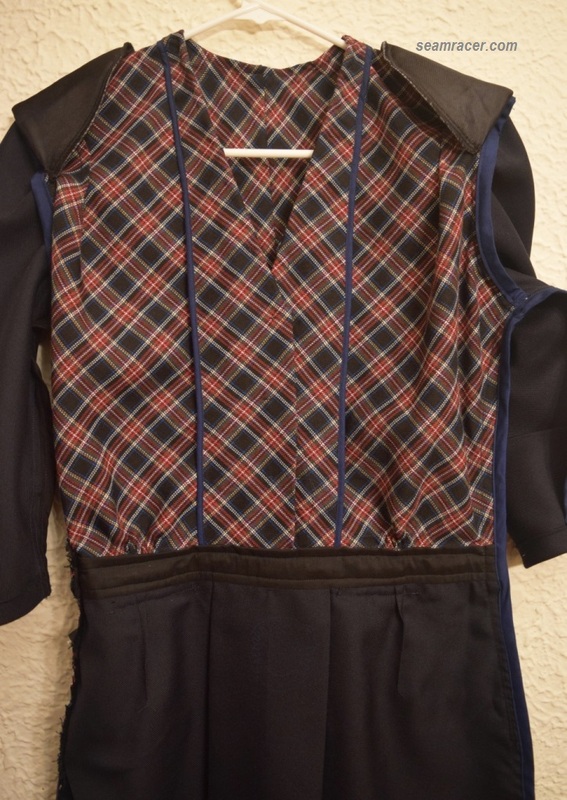 NOTIONS: I had all the thread I needed, I used a modern zipper in the skirt, modern shoulder pads for replacement in the jacket, and new two-tone metal buttons (with an open filigree middle! ), with bias tape packs to make all the insides nice and finished. 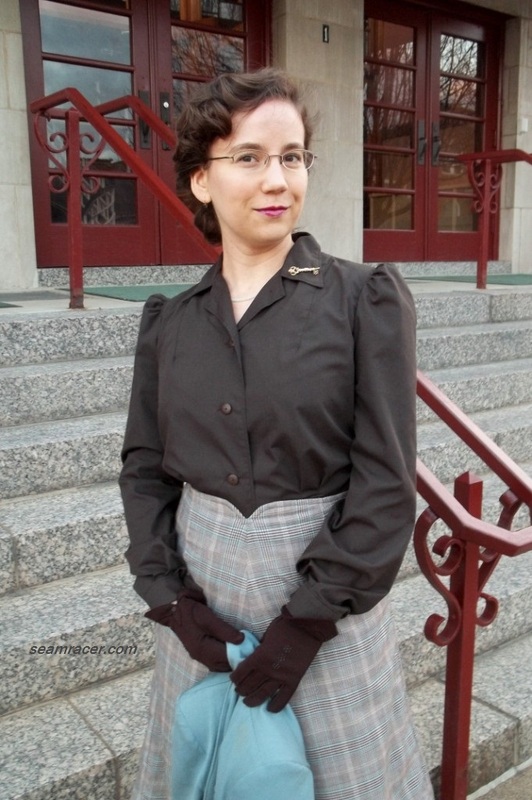 The only real vintage notion used here was the buttons on my blouse – they were from the stash of hubby’s Grandmother. TIME TO COMPLETE: The jacket was re-fashioned in about 6 hours and finished on January 8, 2016. 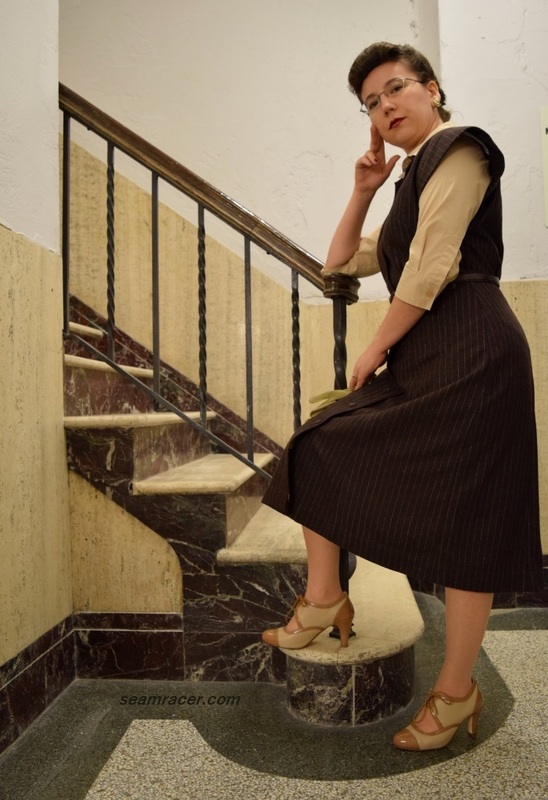 The skirt came together in about 4 hours on October 24, while the brown blouse was made in 8 to 10 hours and finished on November 27, both in 2015. THE INSIDES: The blouse and the skirt are all nicely bias bound with lace hem tape. The jacket’s lining covers up all inner seams. TOTAL COST: The vintage suit was bought for $15, the cotton was maybe $10 for 1 ½ yards, and the plaid suiting was on clearance at Jo Ann’s Fabrics at $10 for 2 yards. A total of $35! Before my re-fashion, a beat up mess of a suit set was offered to me for a small amount during one visit to a local vintage re-sale shop. The owner knew I sew. She gave me one of those “Buy this if you think you can do something with it or else I’ll probably end up throwing it away, but I did spend some good money on this” offer. The shop owner was thankfully very forthright letting me know the condition history of the suit set. The suit was originally so dirty when she got it there was ‘no choice’ but to throw it in the wash machine…which ended up shrinking the wool, making the lining’s stitching to fall apart and the metal buttons rust, thus causing brown staining. She had then spray painted the buttons silver to cover the rust. Ugh! That one wash sure got the jacket clean but caused a MESS of problems for me to fix. The shoulders pads had balled up and fallen apart inside, as well. The left sleeve to the jacket was chewed up, but not by moths. It looked like it had been caught in some machinery or run across something sharp that tore it up all the way down the underside from the elbow to the wrist. Other than the sleeve, though, the body was luckily free of holes or fading. 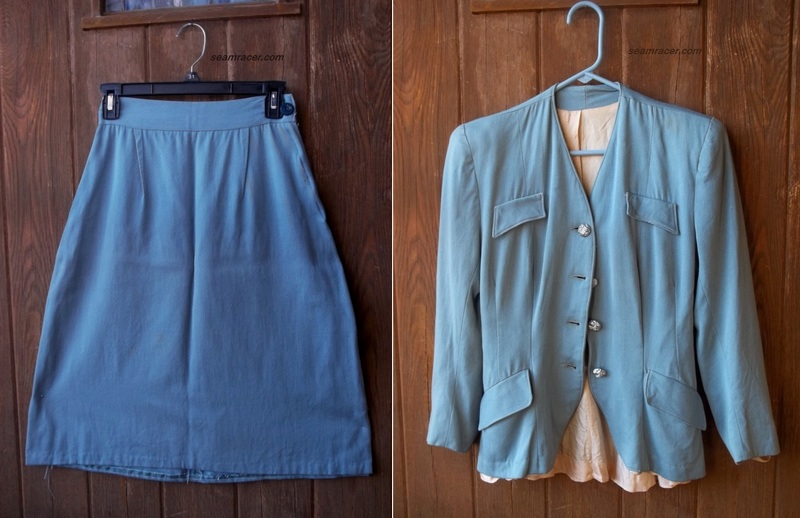 The matching skinny straight skirt was generally fine, with a few fade spots and random holes. The suit did fit me and with its lovely design lines and details, and felt I had to save it for all its potential still left. I guess it’s like going to “just look” at a new puppy – I tried it on, so I was hooked. The capability to give it the attention I felt it deserved is well in my ballpark, anyway. 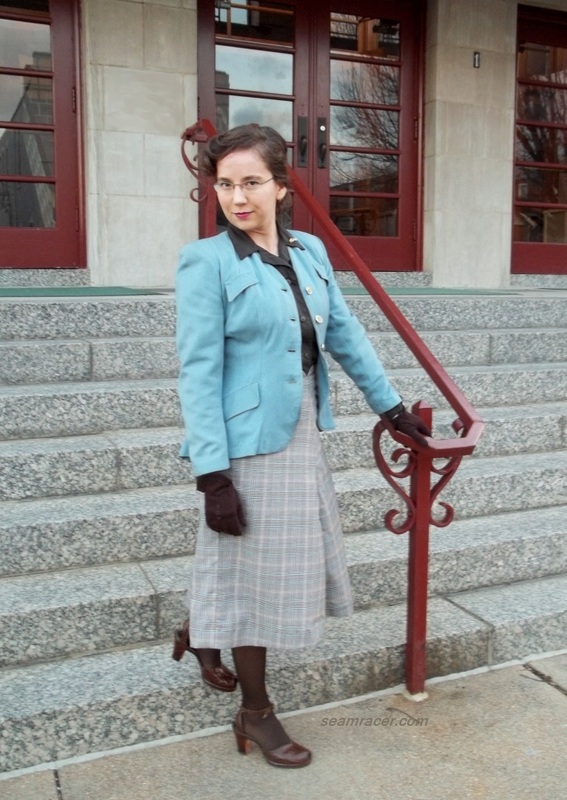 The bittersweet fact is that many vintage suits do not have their matching skirt as this one, but that skirt was unfortunately sacrificed for the jacket to save face. I was hopeful, but slightly doubting my efforts would turn out so well. As it had been washed once already, I took the old buttons off, added stain remover to take out the rust marks, and washed it once again. With the lining was loose, I could reach right into the jacket and take out the old shoulder pads and unpick the sleeves. I unpicked them completely to use the pieces as a guide to trace out a pattern. The new sleeves have their bias slightly off due to the size restrictions of the skinny skirt, but are overall the exact same. 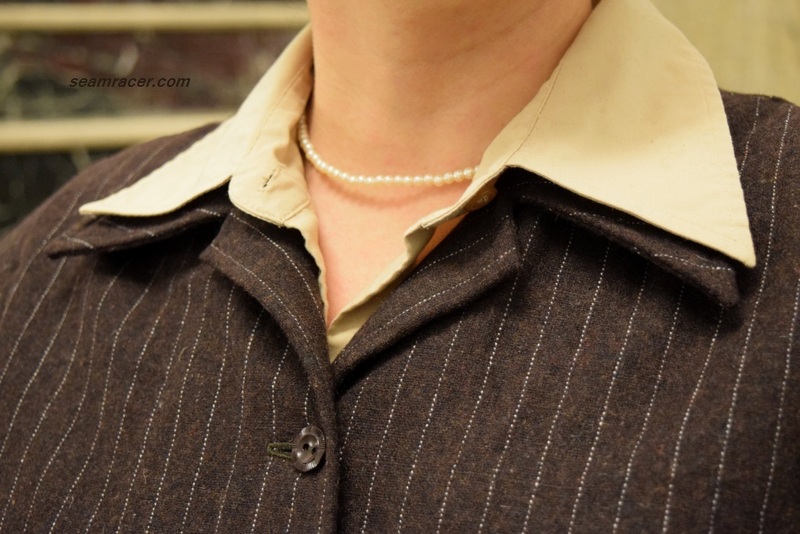 Then, with the sleeve set in, new shoulder pads, and the lining all stitched up by hand, and the new buttons (pic below) as the icing on the cake, I must say this was an amazing renewal for a formerly desperate vintage item. Now, with a new separates sewn to match, it really can shine again for years to come in my wardrobe. The best basic perk is that it is nice to have a new suit jacket without all the effort of starting from scratch. Besides – they just don’t make them like they used to anyway – in way of styling, fit, and material! It’s more like the weight of a coat, it’s so lofty! I am amazed at how sturdy this jacket is to have survived everything it has and still polish up like this. It’s amazing enough to have something from the 40’s last until today as it is. I do really think, from the look of the inside seams, the shoulder pads, and the lack of a label, that this could have been private seamstress or tailor-made, but it’s done so well, it’s hard to tell. As it is now, how unique is a part me-made, yet still vintage garment?! It’s ‘true-vintage-with-my-personal-touch’, I guess. There are many reasons why I absolutely LOVE this blouse. Firstly, it’s in a nice rich earth tone – not ugly or boring and uncomplimentary as some solid browns can be, but it has many undertones that I notice every time I wear it with a different color scheme. Pictures do not do it justice. Not your basic dirt shirt here! Also, it was an easy make, coming together in no time, and it’s perfect for layering with the slimmed down details. It’s a true 40’s pattern, yet without being as obviously vintage as some others, as this one’s lacking a giant sized collar and gathers in the body. There still are the gathered sleeve caps, but there is giant darts that shape the chest from the bust up to the shoulder tops. 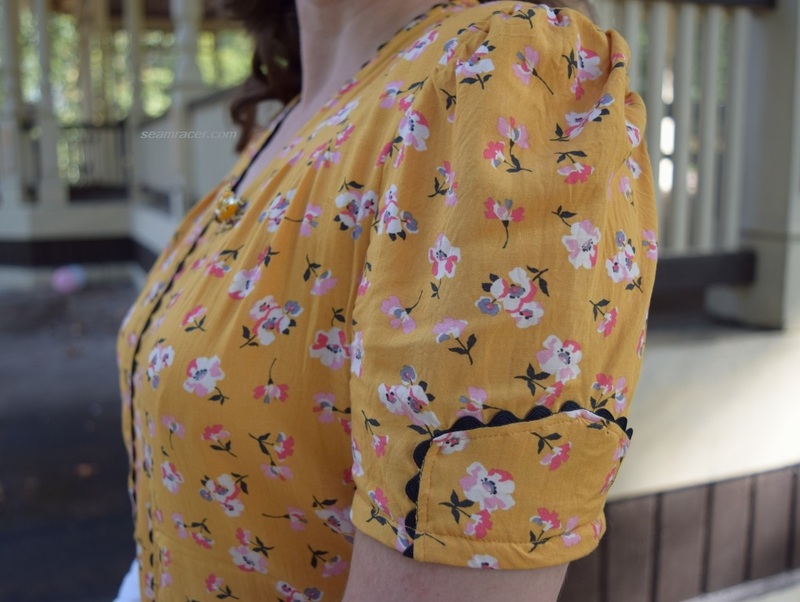 Looking at the pattern envelope front, this is primarily because it is designed to go under a jumper, but to me it is just as good on its own to change up my vintage style. The simplified, toned-down details make this versatile to customization. With a tweak here and a variation here, I can have a different style. This time, nevertheless, I stuck to the original design and left it unchanged. However, the best perk is that this pattern fits me like it was designed for my body in mind, and I can use it without needing to adjust anything. Finding such a pattern in the world of sewing is a real treat. They’re a true gem to hold onto (and copy!) when you have one, especially when it comes to vintage patterns, as sizing and fit standards have changed throughout the decades, and yet even for today as modern wearing ease can be unpredictable. 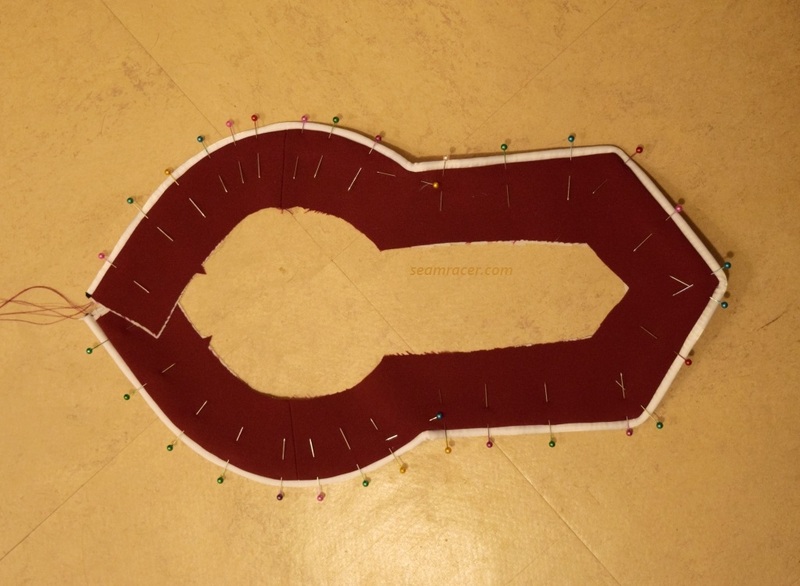 For this blouse pattern, I can just lay the tissue pieces out, cut it out, and whip it together, almost like I don’t really have to think much at all to do it. I suppose the greatest demonstration for how much I treasure this pattern is the fact I have made three different versions of blouses using it, as you will see in the next few posts. I really have been meaning to make the jumper, too, as I like the rest of the pattern so much! The skirt was another quickie project, thankfully. 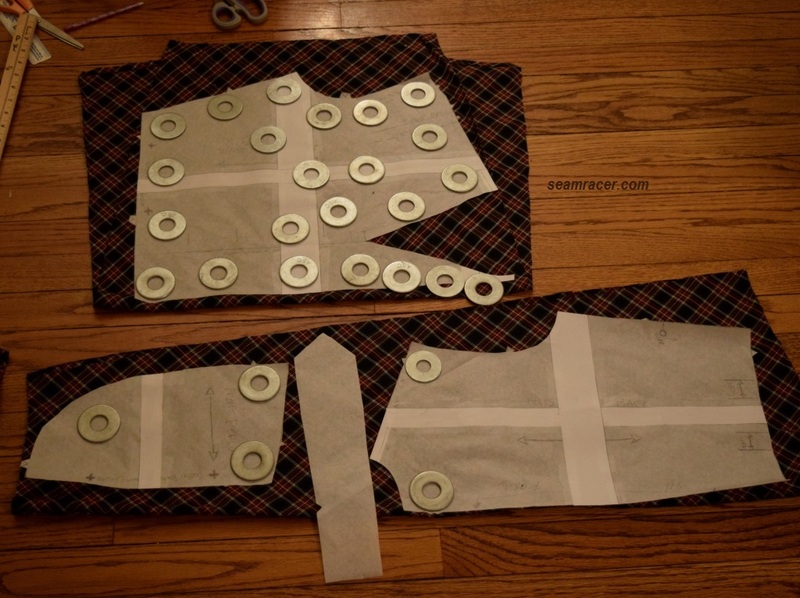 When making your own suit set, even though I didn’t start from scratch for the suit coat, sewing more than one garment to have an outfit can become wearisome by the time you come to the second or third item! This is partly why I made sure that the skirt was so easy-to-make! I kind of knew how this skirt would generally run a bit roomy, as I have made the trousers from the same pattern, so I had the assurance of what size to choose to fit as well as really liking the front curving detailing to the waistband! I also love this skirt – it is a go-to item that matches with lot of other items that I have and has a nice dressed-up look without being too formal. To make up for my limited fabric amount and to match up the plaid in a more pleasing manner, I went rogue against the grain line recommendations. Don’t judge me here, please! I rarely do this and then it’s only when I have thought things through. 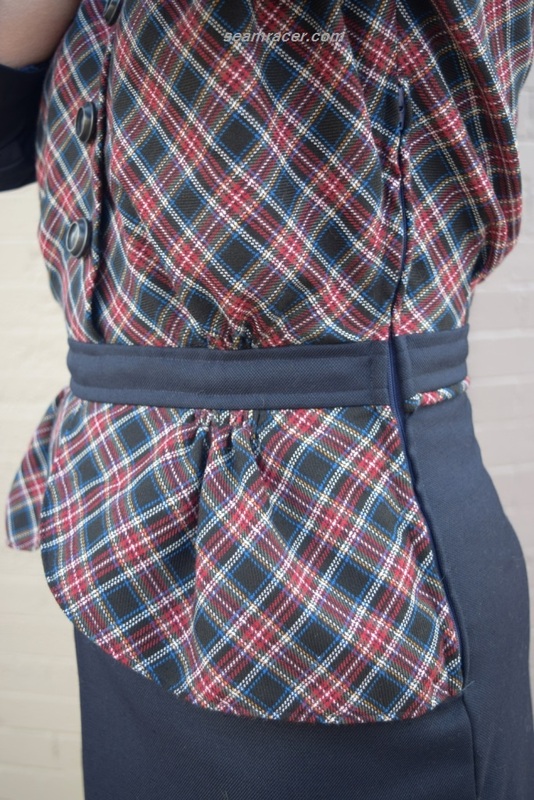 The fabric was a tight, rather stiff man-made polyester so it was not going to have much of a grain line from the fabric, so I merely stuck with matching the plaid up well. In order to fit the two skirt pattern pieces on my yard and s half, I stuck with the same tact as some of my other 40’s plaid skirts. 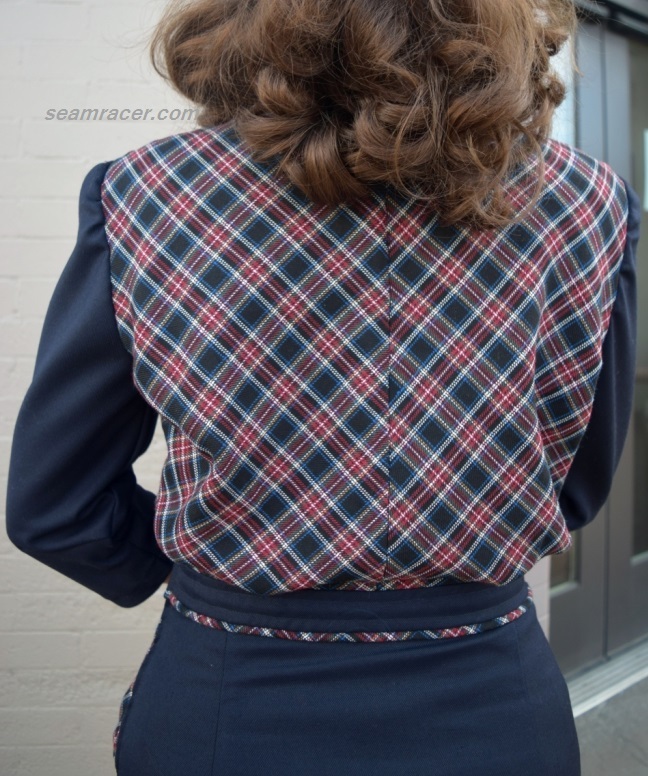 The A-line shape is emphasized by having the plaid line up horizontally on the side seams, while the plaid miters together at an angle in the middle front and back seams. For a fabric more drapey, this layout probably would not work as well, but I like making the most of the little of what I had to make an idea work. The finely detailed and openly-spaced plaid lends an interesting visual texture to the suit set, I think. At first I wasn’t sure that such strong colors on my top half would overwhelm the muted but busy skirt fabric. However, the plaid does have the tendency to look weird from a distance in the full shot pictures for some reason! There is a sneaky bit of turquoise in the plaid actually, if you look up close. 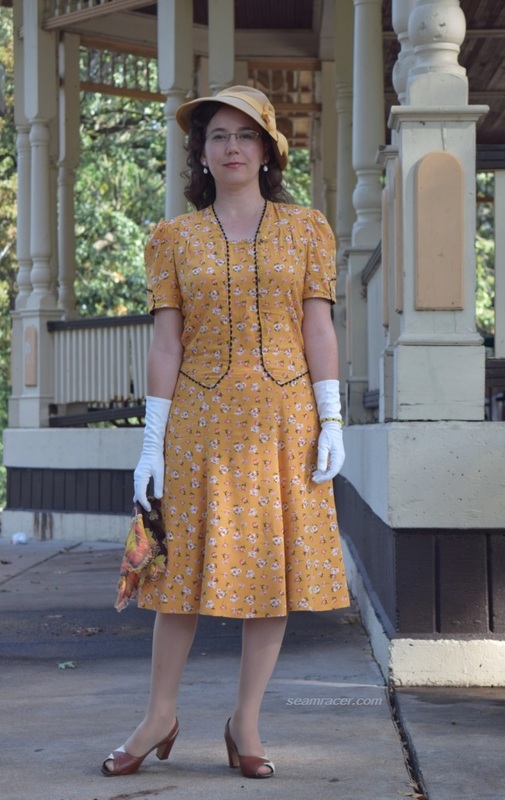 As I mentioned at the beginning of my post, this is the first time I feel I have been able to assemble a cohesive outfit from garments across the entire decade of the 1940s. The blouse is from the beginning of the era – year 1941 – when many styles were still very 30’s inspired, fully feminine and dramatically distinctive in the decade. 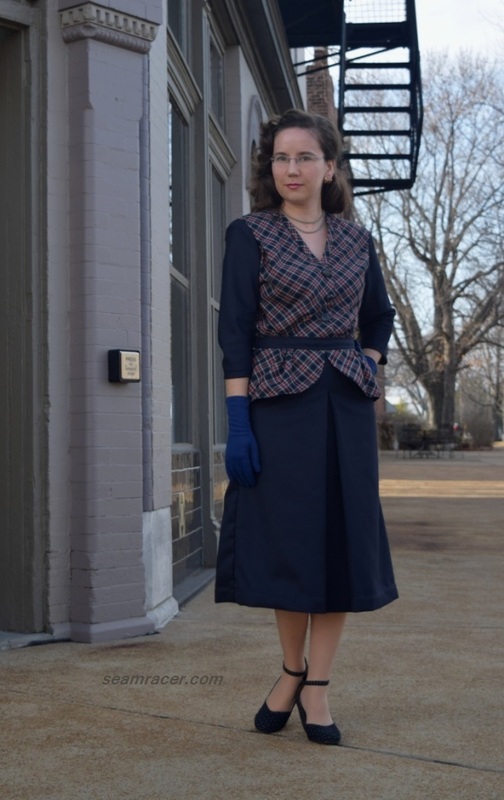 The suit is I suppose from circa 1946, when extra fabric was again allowed, as it has a longer length, flared peplum, and decorative pocket lapels. The skirt is (again, from my estimation) a little later than the suit, circa 1947 or 1948, especially with the slightly longer length. 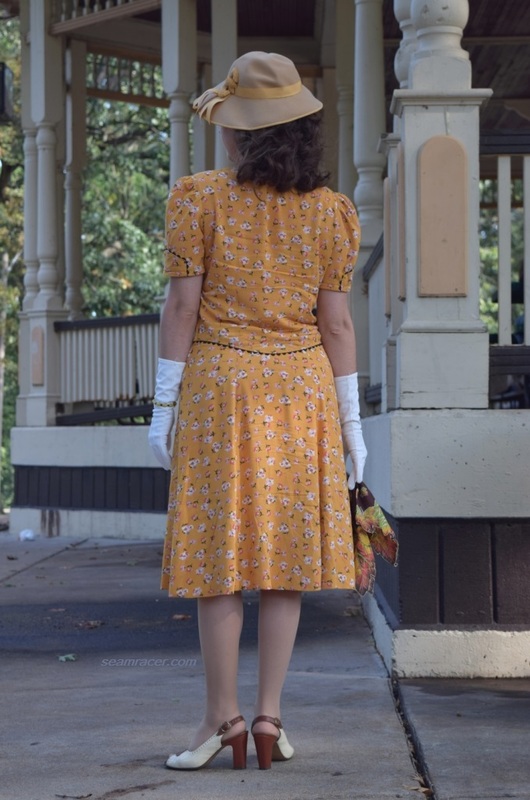 It was common for a woman from back then of the 1940s to have worn garments many years old already, but with all the inventiveness, the refashioning, and desire to not publicly show that rationing was putting a cinch in their fashion life, I imagine an outfit that spans 7 years might have been a stretch. 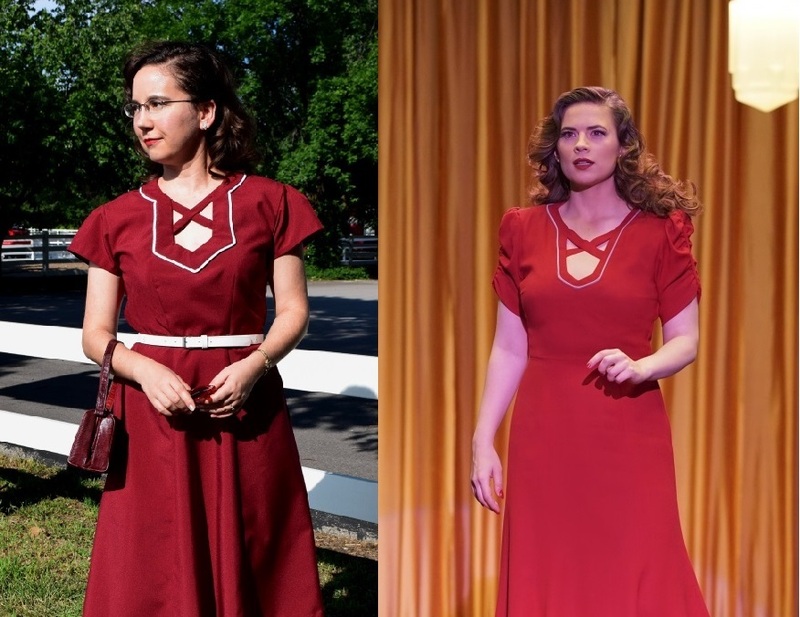 To me, I see set differences every two years at a time in the styles of the 1940s (such as hem lengths, sleeve styles, body emphasis), but I will leave a discussion of this for another time. I will say that, for some reason, it seems the conventional stereotype for the 1940’s seems to be circa 1945, when skirts were quite slim and under the knee, as if the wartime fashion was the benchmark for the era. 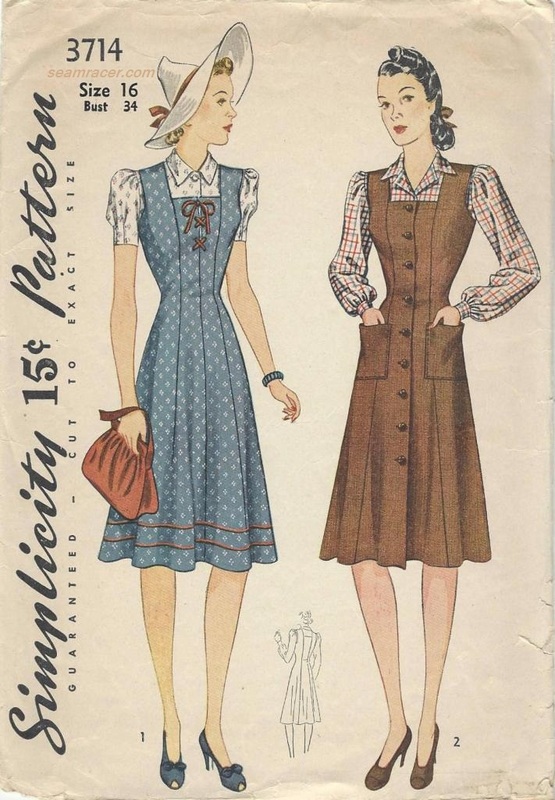 In reality, there was so much variety in the decade that a dress for 1940 compared to one from 1949 would and could totally confuse someone as to how to “do” 40’s fashion. There was as much going on in history at the time as there was in the garment realm, and so 40’s style can be all over the place! There is no “one way”, and that’s the beauty of how the 1940’s can appeal to so many people with so many individual style tastes and body shapes. I always like to respect the style differences I notice in each year of the 40’s because I see it as important to realize the rhyme and reason behind them. 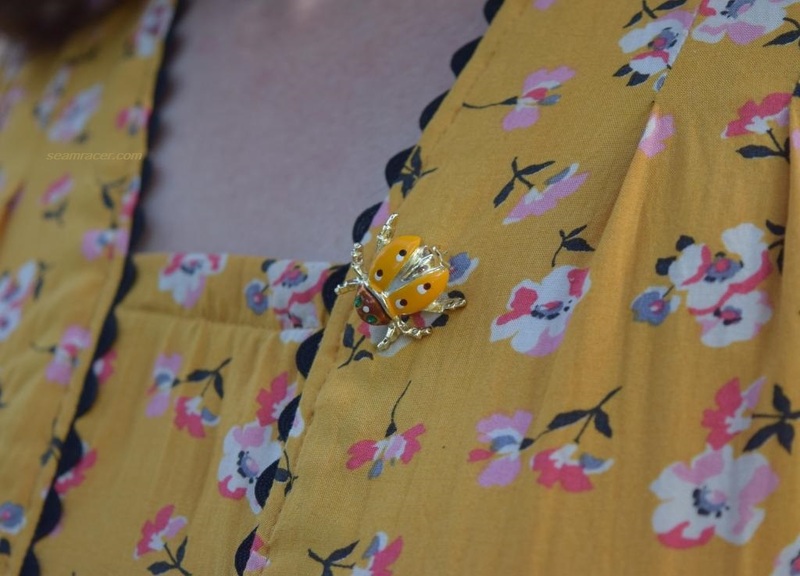 However, my sewing is about personalizing fashion for me – after all I am the one making things – and learning and feeling fulfilled are the greatest perks I enjoy about it along the way. 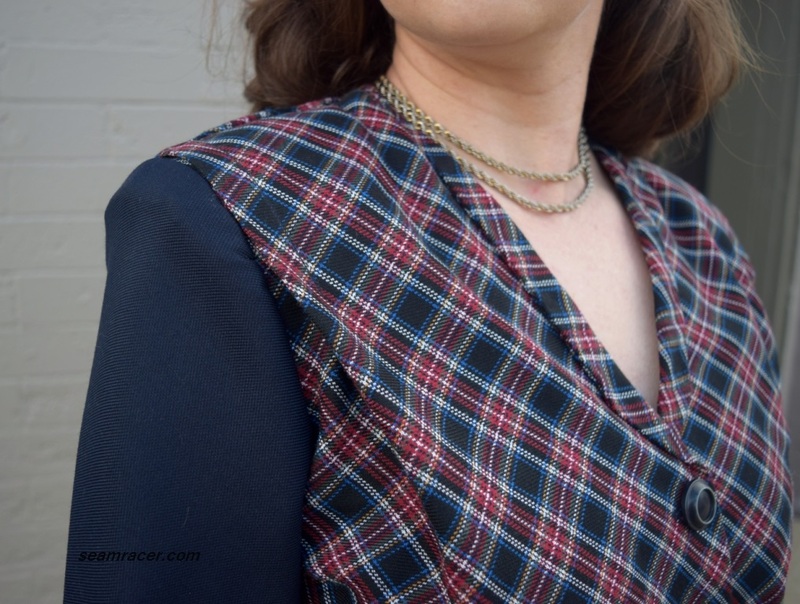 Thus, I enjoy the fact that I am able to a slightly less predictable style of a blouse from pre-war, and incorporate it with a skirt from post-war, and a suit blazer from the very end of the time of the fighting and rationing. I certainly did take a very “made do and mend” 1940’s attitude to the pitiful condition of the jacket as I found it! I hope the original owner of this blue suit would be proud at how I saved it to reinvent a new suit set 70 years later. 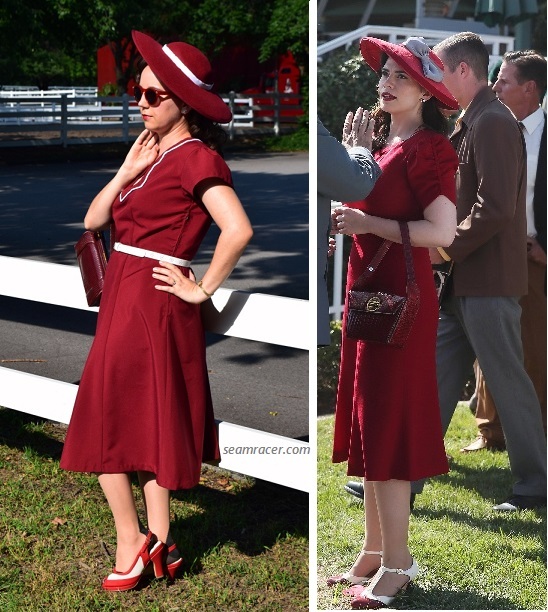 1940’s year differences, modern fabrics, vintage tailoring, self-made fashion, and a refashioning mentality have all made peace together with my outfit! The thing that many downward spiraling leaves and a dizzying corn maze have in common in the season of fall is a golden rich hue. I’m talking about the color called “saffron” that has been popularly seen everywhere beginning in the early fall of this year…it’s also called mustard, goldenrod, and harvest gold among other things. However, I love word puns, so I’d like to associate my dress as being more the color of the traditional grain maize, with a title that calls to mind one of the joys of autumn that a field of corn can provide! 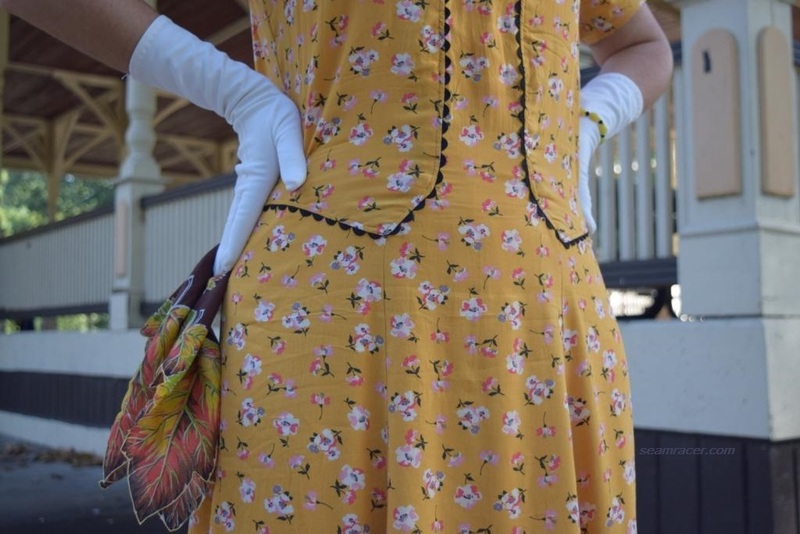 This dress is so comfy, the skirt is so swishy, and the details are so unique I can’t help but love it, although I’ll admit it was a bit hard to like at first because it is so quaint and more blatantly dated in style than much of what I make. This dress does have rick-rack and an obvious vintage metal zipper in the side closing, after all. Nevertheless, I enjoy trying novel things, and that includes new styles, new colors, new sewing pattern companies, and new techniques. 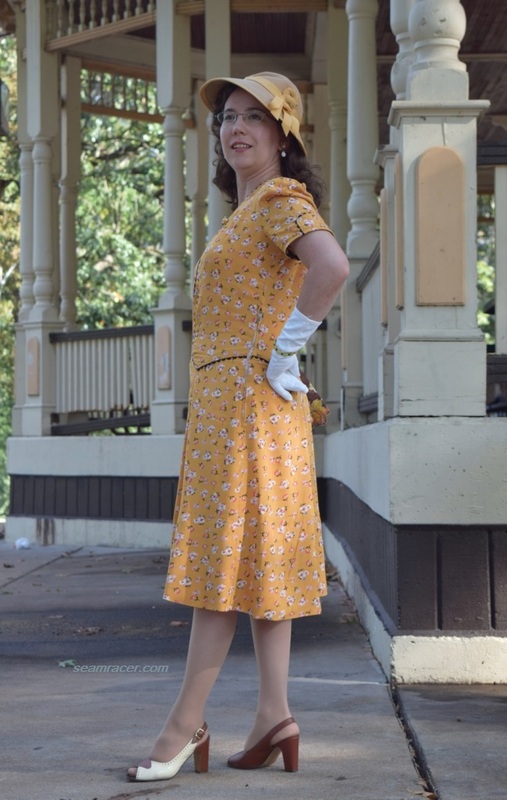 This dress has all of that in one project…so hooray for a feminine and fun vintage dress in the latest color for those warm “Indian Summer” days of fall! NOTIONS: I had all the thread I needed, and the oversized rick-rack and vintage metal zipper I used were from my existing stash. TIME TO COMPLETE: Even with the tricky paneling and added rick rack, this dress was still relatively easy, made in 8 to 10 hours and finished on September 10, 2017. THE INSIDES: All the seams are either enclosed in bias tape or French finished, with just the armholes left raw edged. TOTAL COST: This was bought at Jo Ann’s Fabric store within the last few months, for a total of about $10 to $12. 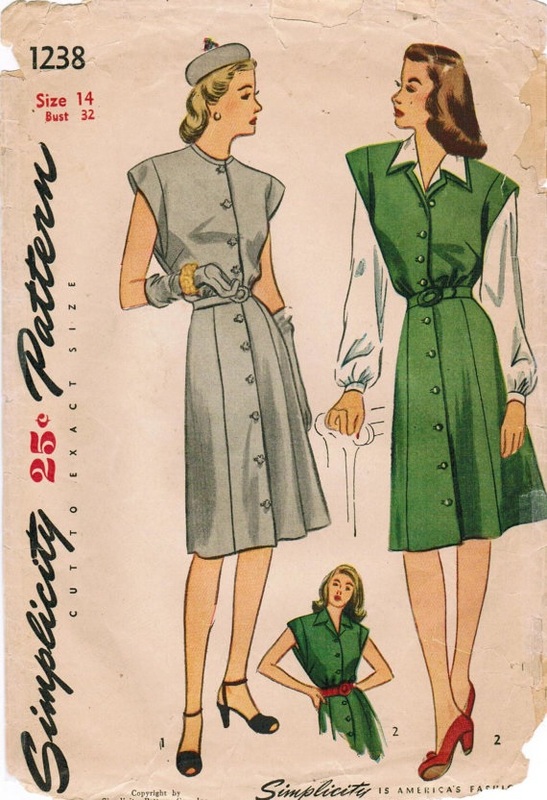 That American Weekly dress pattern has been stumping me for the last few years since I bought it. As much as I liked the design and wanted to make a garment of it, I could not figure out how to picture myself in the dress or get past the example drawing to see my own interpretation. 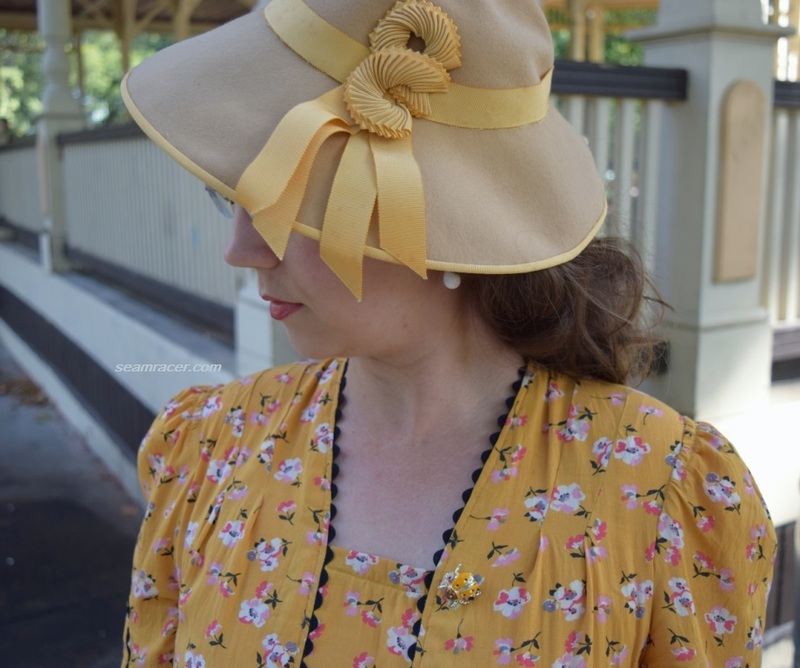 On a completely different strain yet a similar situation, when I bought the golden floral rayon, I loved it and knew what era of vintage it would be perfect for – the late 30’s to early 40’s. 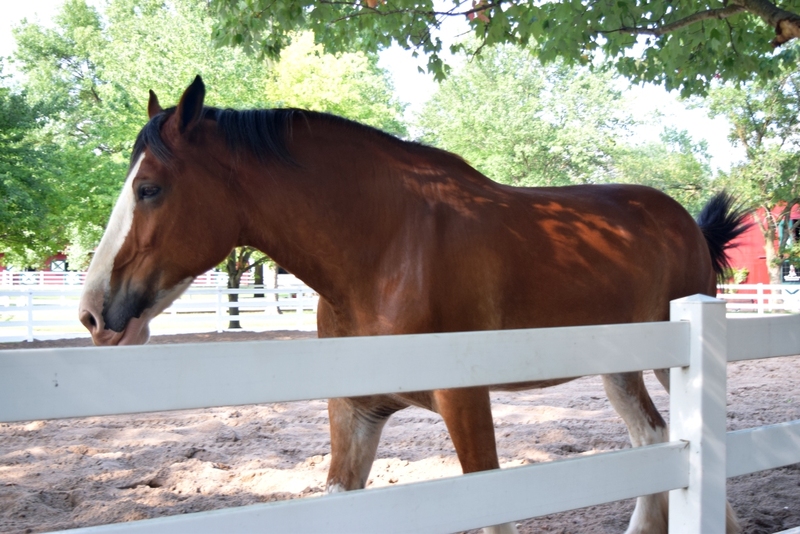 Yet once it was brought home, I realized I was stumped with how or what to make of it. Both the pattern and the fabric were dually stumping me in their own ways. Maybe this is why the two of them felt right for one another in some vague way when I was sorting through my pattern stash for ideas! I am so glad I have found a way to conquer the rut I was in and make something I love wearing! For me, pairing a pattern with fabric and notions is something deep down inside I can’t always pin down, a sort of creative intuition. No matter what I want to do, sometimes I need to wait for right moment of inner approval for me to sense that I have made the perfect match. Many times the process of a project coming together is different, such as pairing fabric off first, or being inspired by the notions or merely a picture, but it all feeds my creative intuition that keeps cranking out ideas which keep me going. Although I see it mentioned nowhere at all on the pattern, when I was doing my preliminary fitting of the tissue pieces I realized this was a petite Junior miss pattern, not in adult proportions in other words. I can’t help mentally pat myself on the back for finding this out ahead of time and not just whipping it up. Never assume too much when it comes to vintage patterns! Check them out fully and figure them out before you reach for those cutting scissors, especially with old mail order patterns…I’ve made enough to know by now you can’t exactly know what to expect. I retraced the pieces out onto my roll of sheer medical paper so I could then cut, tape, and otherwise re-size the pattern. I suppose this time I had an obligation to preserve this pattern by being ‘forced’ to make a copy if I wanted to sew a dress out of it! The sizing read as a nicely “normal” bust-waist-hips combo for me, and it should have technically been a tad big. 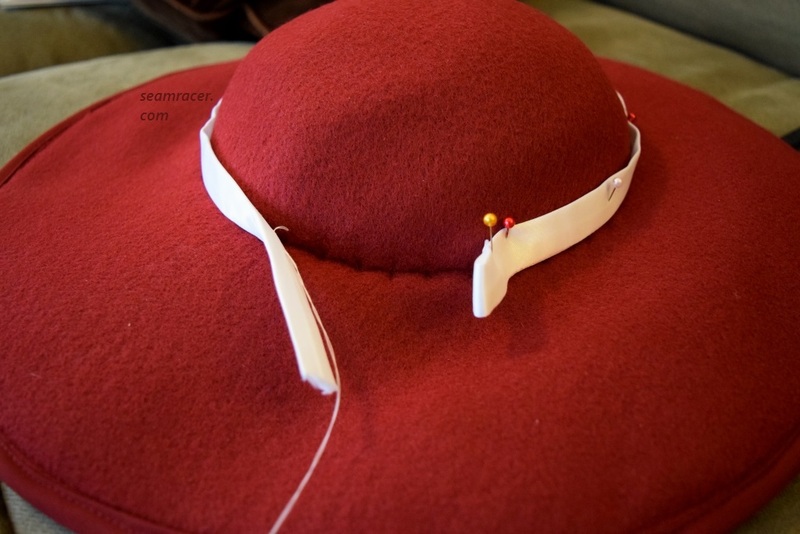 Just to be safe, however, as well as to have bigger seam allowances than the given ½ inch, I did add some ease to the side seams. Good thing I did this! Even with the extra width, the pattern still ran small enough to fit perfectly…I would not want it any more snug, especially in the hips. Apparently not only is their sizing chart off when it comes to the finished dress but there was not a designation for body height sizing either. McCall’s and Simplicity would use the term “junior’s” on their patterns and generally would be in the small sizes like a 30” bust. My pattern was a size 16, for a 34”-28”-37” body, so it was not a small size by vintage standards. Although there have been other mail order patterns I have come across which had some mysterious, slightly shortened proportions, this pattern was so short…it made it look so tiny! It needed over two inches added to bring the bust, waist, and hips down to where they needed to be. 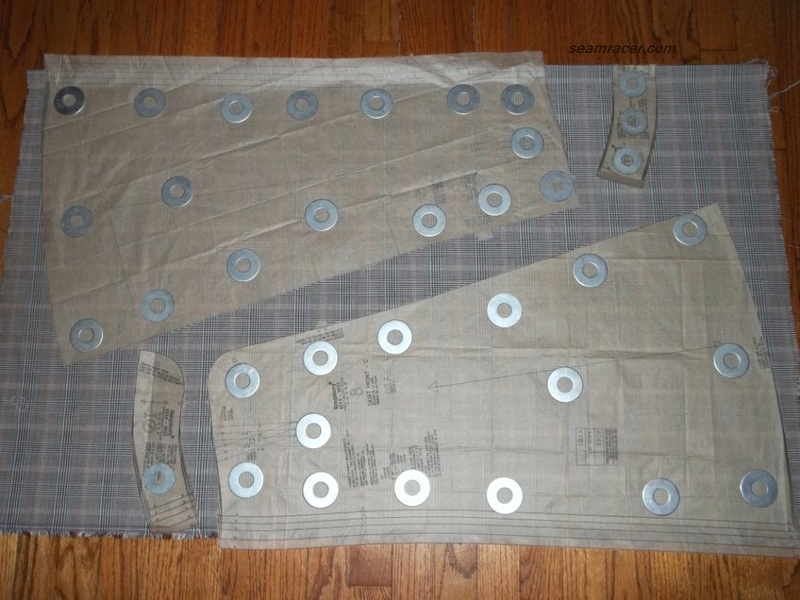 Just how many American Weekly patterns are actually in a junior’s size and no one would know the better until the tissue pieces get fitted on someone? 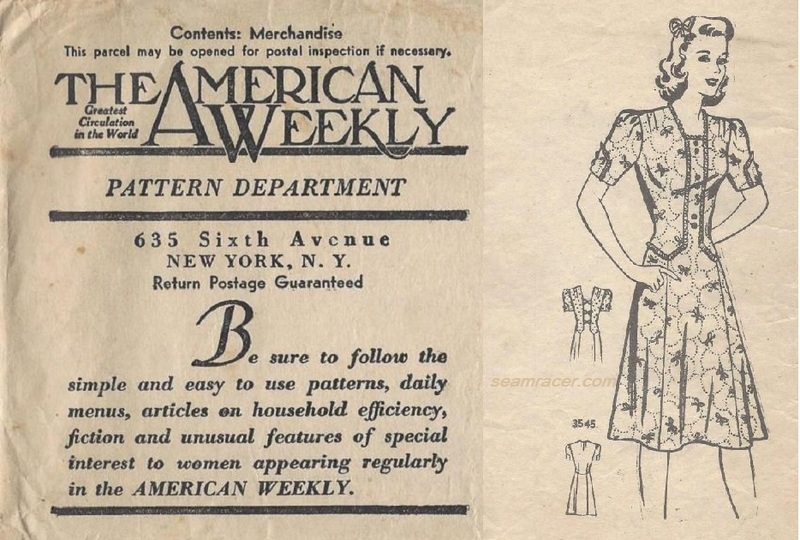 Sizing complaints aside, American Weekly patterns were offered through a Sunday supplemental magazine of the same name produced by Hearst for inclusion in their newspapers – kind of like the modern day “Parade” leaflet. At one point, it was billed as having a circulation of over 50,000,000 readers! 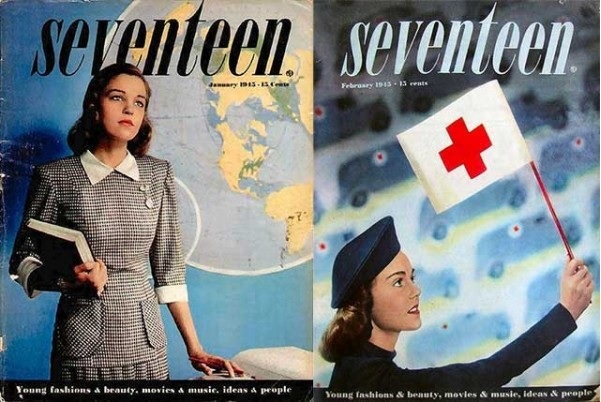 Apparently this magazine only offered patterns from circa 1940 through the 1950s. As I can find proof of one of the first American Weekly patterns, dated to year 1940 with a number that slightly precedes the numbers on this post’s pattern, I am pretty certain at dating my dress as year 1941, when the patterns just started being offered (besides basing the date on the style). My instruction sheet says that their patterns only come in 5 sizes for anyone between a 30” to 38” bust, so that is not a whole lot of variety! The actual construction directions were some small line drawn pictures and several brief paragraphs of text – not much for those you who would need assistance. American Weekly patterns do have some really lovely styles, nevertheless! Nothing I’ve seen is really is jaw-dropping, but they strike me as subtly complex and harmoniously designed. Enough facts…look at the dress’ lovely details! 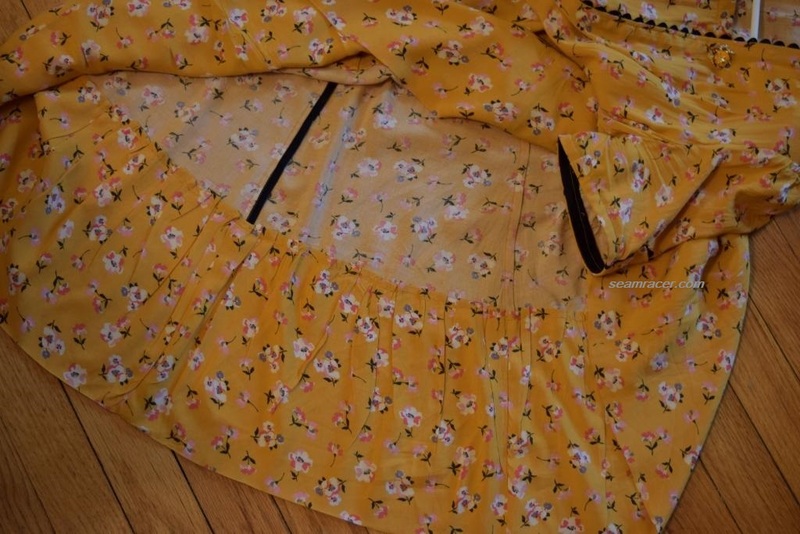 It has mock tabs on the hem of the gathered-top sleeves, and a mock-jacket look to the body. The curving to the bodice panels was amazing on the pattern and really make for an interesting, unusual, yet quite complimentary fit. The dress elongates the bodice and puts emphasis on the hips, yet the full skirt and wide, strong shoulders (thanks to the sleeve tabs) balance it out. The bodice dips lower in the back than in the front, but as the hips turned out snug, this feature is not as obvious as I’d liked. The skirt is 6-gored for a very pre-WWII fullness, with each of the skirt seams perfectly lining up with the bodice darts in the back and the two bottom points to the bodice angles in the front…simply marvelous symmetry of design. This sure gave me an opportunity to use up a pack of giant rick-rack from my stash of never-touched notions in order to make sure the lines of the panels didn’t get lost! The points, curves, and corners of the dress sections were tricky already, made trickier by the rick-rack, but I just love the interest the exposed notches create. I probably could have achieved sharper points had I not included the rick-rack but – oh – how it brings this dress to a whole different level I’ve never had before! Previously, I always had this idea that rick-rack was very home-sewn distinguishable, and for feedback dresses or aprons, even though I do have a generous stash of it. I tested rick-rack out on this 1945 top, loving the results, and the more I’ve recently looked at really creative uses of the stuff, the more I felt I need to dive in with a major project, and that this was the one. Similar dress designs from about the same time frame use the “half-rick-rack” method on the edges (see Marion Martin #9547 and my fabric inspiration dress New York #1368 from the late 30’s/early 40’s), so it seemed like the proper thing to do for a style like this anyway! Adding the rick-rack was really time consuming, especially as I went to the extra trouble to tack the points down to the fabric so they would lay flat nicely. I realized after the dress was done that the rick-rack actually does much to stabilize the bodice seams of shifty rayon, thinking practically. Going out on a limb can be so amazing when it’s this successful. “Three inch hem” according to the instructions, my eye – the dress, unhemmed, came down to my ankles! I ended up doing a hand-sewn hem that was actually 8 ½ inches deep (see picture above at “The Facts”)! Initially it was because I didn’t want to cut that much off my dress, but then I realized by making the wide hem it actually helped the dress immensely. Firstly, the wide hem weighs down the otherwise very full and floaty skirt. It keeps me from having a “Marilyn Monroe” moment of my skirt coming up on me and gives it a very feminine swish when I walk and especially twirl! Secondly it makes my skirt opaque, much like a self-lining, so my lingerie slip doesn’t always have to be the perfect length. Lastly, I didn’t have to commit permanently to a certain length. I like my clothes to have the versatility to be tailored and changed if need be so that they’ll be something I’ll be happy with and fit into for many years. One of the good surprises to this dress is actually how versatile it is to accessorize. In these photos, I went for the brown and snow white tones, but is also works well with black shoes and earrings, as well as dusty greys as well as maroon brown-reds or orange tones. My two-tone, brown and cream, slingback spectator heels are actually a good example of how the 1970’s era can imitate the 1940s era so closely the difference is almost indistinguishable. What I like about 70’s-does-40’s shoes are the chance of finding them in a much more wearable state, as well as cheaper prices! The rest of my accessories are true older-era vintage, however. My gloves, my earrings, and the little beetle brooch are all from my Grandmother, while the 40’s hat is my very first vintage piece of headwear I acquired from a second-hand shop so many years back now. 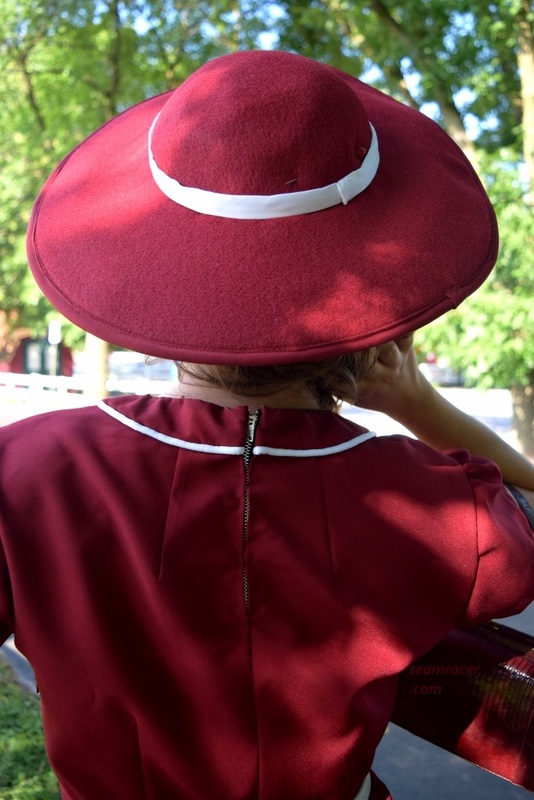 It’s so hard to find brimmed hats from the 40’s and earlier in decent condition, and this one is a winner that has some stunning petersham ribbon decoration to boot! In fall weather my allergy sensitive nose needs attention too, so I couldn’t resist grabbing this lovely seasonal handkerchief from my collection to pair it with my outfit for the day! Yellow does have the connotation (at least so I’ve heard) that it does not “work” for many people, but I think this stylish golden hue is a bit more promising than other ochre shades! 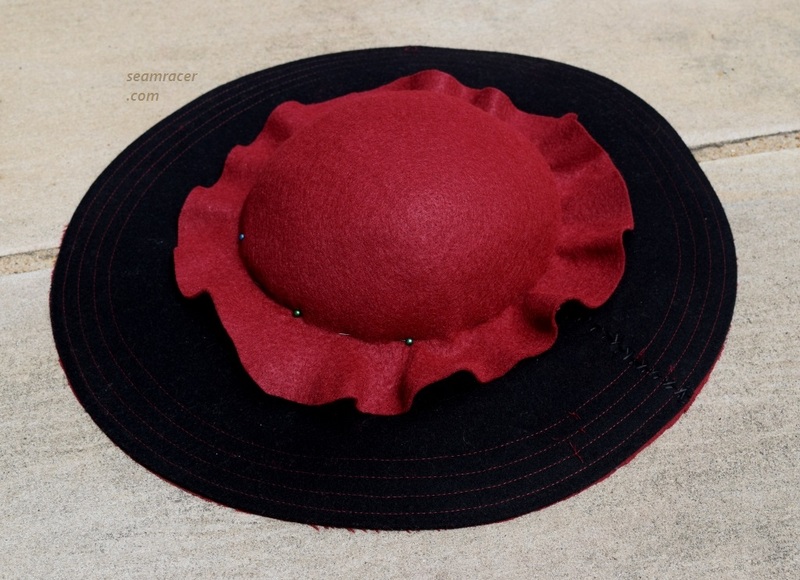 Granted, I suppose I am a bit biased…I have made a hat in this shade already! Besides, I know that just because something is pushed as a style ‘trend’ or ‘fad’ doesn’t mean people really like it on their own terms, after all. My hope is that I have presented an attractive way to style and accessorize this golden maize color, though. I have taken what is on trend, and interpreted it for myself using the way the past had done it before. What goes around comes around and fashion is persistently resurfacing in surprising ways. In the hands of someone who sews, fashion is whatever you make it! Are you or have you worn a similar golden tone, or have you used your sewing talents to find a way to better like a style or shade of color?